Everything that led up to you and your husband meeting is something you treasure. And the thing you treasure most of all is his birthday - the day that kicked it all off. Let your husband know how much you love him. How much he means to you and how much better he makes your life. Your husband's birthday is one of the most important days you celebrate. Make sure this year it's a spectacular celebration. Happy Birthday to the love of my life - Today is your birthday. The day you came into existence. The day that enabled you and me to meet. And that makes it the best day in the world. As long as you’re by his side, there’s nowhere else in the world you’d rather be. 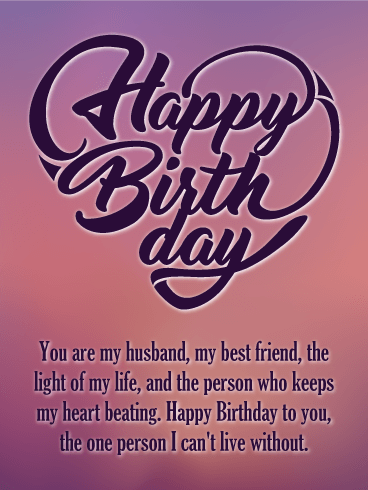 This year, wish your husband a happy birthday by sending him a card that reveals just how you feel and how much love you have in your heart. The image of a couple holding hands on the beach at sunset will let him know that he’s your partner in life and an amazing person who deserves to be celebrated, today and always. 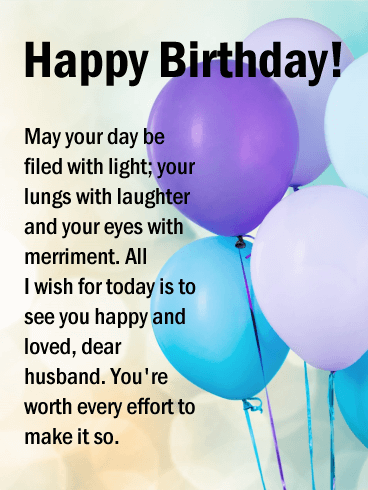 Colorful balloons float in the background above a heartfelt message, creating a wonderful expression of your feelings for your husband's birthday! 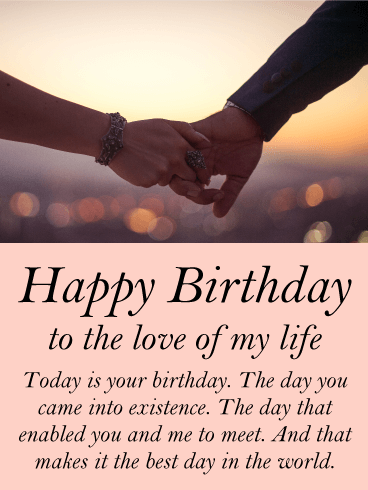 This sentimental birthday card lets you remind him that with each passing year, you are given the chance to let him know what an amazing person he is...which is the most wonderful gift of all! 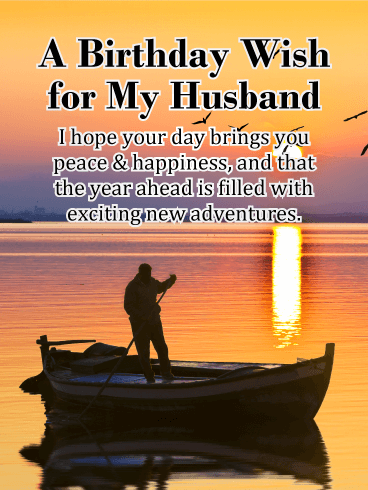 Here's a special greeting for a special husband on his birthday. A radiant golden sunset over the water creates a peaceful scene, reminding him to surround himself with happiness and look forward to exciting new adventures in the year ahead. From awkward dates in coffee shops to nodding to music in a bar too loud to talk, you and your husband have shared many a table and celebrated numerous things. Good drinks, bad, comfortable silence or constant chatter, the experience of it never mattered. What did was the person across from you. 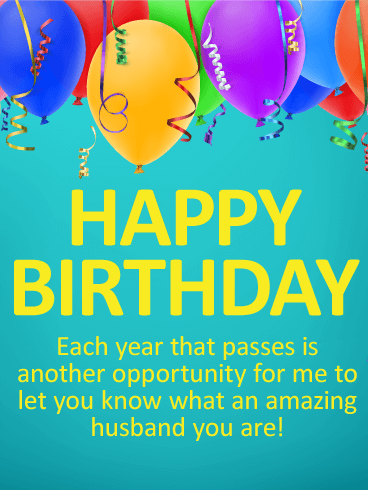 Wish your husband a happy birthday and let him know how much you love him. Nothing in the world beats the feeling of coming home to the most important person in your life. Of sharing your life with your best friend. 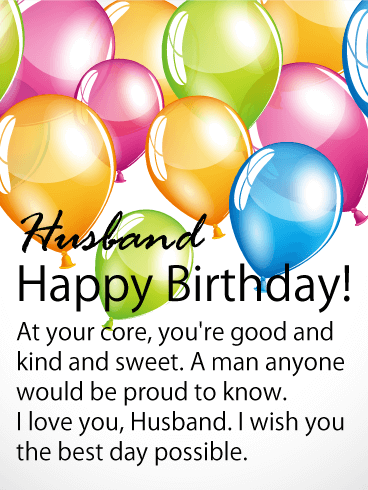 Today, on your husband's birthday, celebrate him. He's the core of your world and deserves to be told how important he is, to be showered with love. Wish him a happy birthday and let him know hasn't just captured your heart - he is your heart. 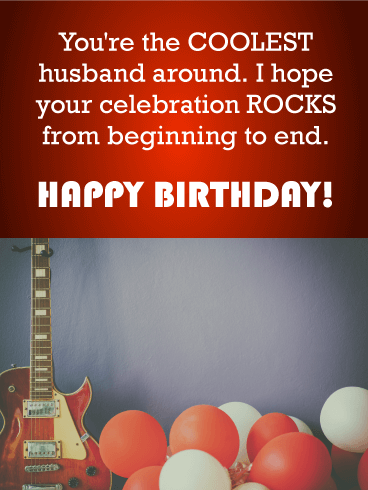 For the husband who rocks, here's the birthday card to surprise him with! Complete with a cool guitar and festive balloons that set the scene for the ultimate party, this groovin' greeting will let him know you're wishing him an awesome celebration from beginning to end. Husbands are the men who lift us up. Lift up our spirits. Lift up our self-confidence. Lift up our achievements. They support us so much, we don't know where we'd be without them. For your husband's birthday, take the weight off his shoulders and help him float in bliss. Let him know what makes him amazing, why you love him, and then treat him to the best birthday in the world - starting with this birthday card. He may be getting older, but he just keeps getting better! 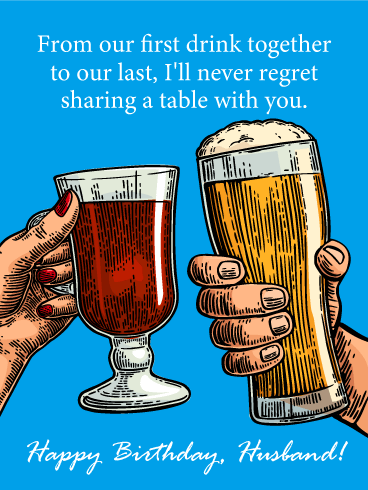 Raise a toast to your husband on his birthday with this romantic birthday card. 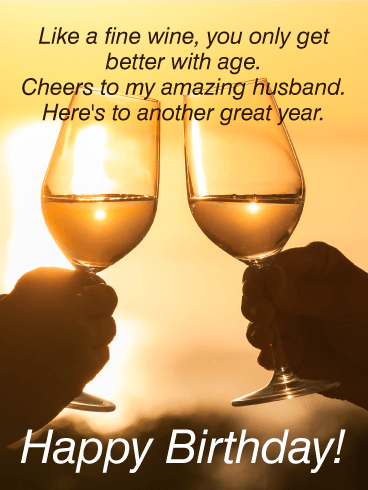 Two wine glasses come together, the sunset streaming in behind them, to bring him wishes for a memorable celebration and an even more memorable year ahead. Birthdays are magical times where wishes are made and then come true. 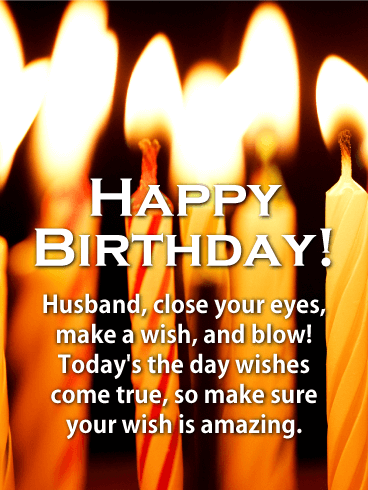 Show your husband the true power of love by ensuring his birthday wish is granted. Be it dinner at his favorite restaurant, or a quiet night in, his birthday is all about him. But the best part about the day is your husband will want to share it with you. So go out, make birthday wishes a reality, and know that you and your husband were meant to be. When you love someone, you wish them the best. The best life, the best experience, the best of health. Because seeing someone you love doing well is the best feeling in the world. 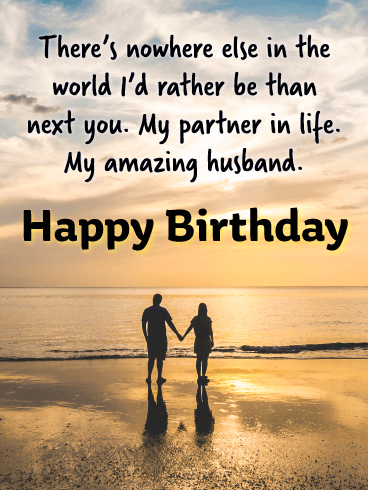 For his birthday, wish your husband the perfect day. Do what you can to make it happen. His smile is worth all the time and effort put into making it appear. And birthdays are the perfect day to let your husband know how much you love him. Mmm, your husband in a suit is attractive, but that has little to do with the cut of the fabric. It's his air of confidence, the assurance he will get things done, the promise of success. 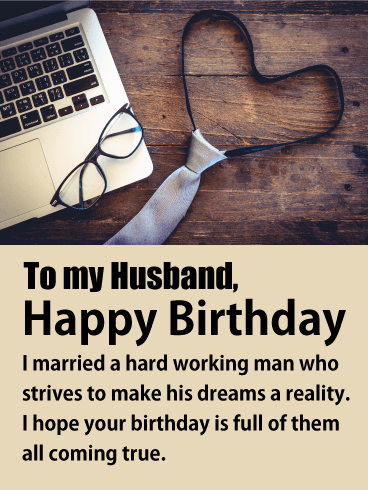 Let your husband know that on his birthday, he can stop working. This is his time to relax with you. What he wants will come. In the meantime, his birthday should be full of the simple things that make him happy. Like this birthday card and you! Meeting the man who became your husband was a magical experience. And now, years later when you look at him, you're still struck by him. He brings a touch of mystique to your life, has opened your eyes to wonders you never imagined. And he keeps doing it year after year. 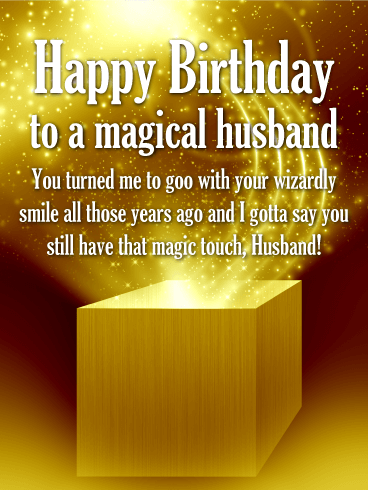 On his birthday, let your husband know his spell on you is stronger than ever and you wish it'll never fade.